Samuel Jacob Victor Fox was born on (April 13) (March 23) July 3, 1893 in Nottingham, England. His father, Joseph Fox, was born in 1865 in Russia of Jewish ancestry. His mother, Bessie Fox, was born in 1863 in Russia of Jewish ancestry. His parents married in 1882 in Russia, where their first two children were born, Annie (b.1884) and Rosie (b.1885). In 1890 the family moved to England. They lived in Nottingham, where the third and fourth children were born, Fannie (b.1892) and Victor (b.1893). The father was a clothing merchant. In 1896 the family moved to America and settled near relatives in Fall River, Massachusetts, where their fifth and sixth children were born, Etta (b.1898) and Marion (b.1900), which made them the first U.S. citizens in the family. They lived at 129 County Road in Fall River, MA. On April 21, 1904 his father became a naturalized alien citizen, by which status the wife and all children became U.S. citizens. In June of 1907 at the age of fourteen, after having completed the ninth grade of school, Victor S. Fox entered the work force. This was a common custom for most teenagers in America at that time. He was a stockroom worker at a clothing store where his father worked as a salesman. In 1908 the family moved to 609 Cherry Street in Fall River, MA. In 1914 the Fox family moved to New York City, where the father operated a women's clothing business. The family lived at 555 West 155th Street. On February 24, 1916 the New York Times reported Victor S. Fox, Harry T. Johnson and E. Goodman had registered a newly incorporated ladies' apparel business in NYC. 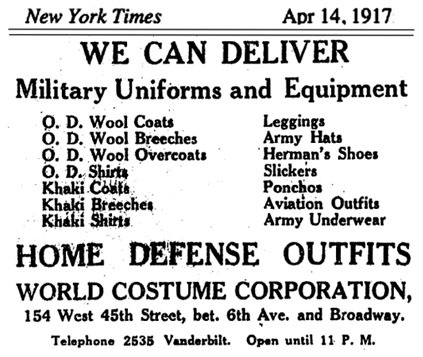 On April 14, 1917 the New York Times carried a paid advertisement for World Costume Corporation at 154 West 45th Street, between Sixth Avenue and Broadway. The company supplied a full range of military uniforms and equipment, including home defense outfits. On November 1, 1917 the Business Records of the New York Times reported a NY County Court had filed the judgment that a debtor owed $321.95 to Victor S. Fox of World Costume Corporation. On November 17, 1917 the New York Times reported Business Troubles for Victor S. Fox, a manufacturer of costumes at 15 West 45th Street. The Bankruptcy Court assigned ownership of his business to William H. Kaiser. On July 26, 1918 during the Great War Victor S. Fox was inducted for military service. He served as a Private at an Army Camp in Virginia, where he worked in the Quartermaster Corps. Five months later he was discharged on December 24, 1918 and returned to NYC. In 1919 Victor S. Fox was twenty-five. He lived at home with his parents and unmarried sisters in an apartment at 555 West 155th Street in Upper Manhattan. He worked at an export company that sold uniforms and general merchandise. After the war Germany struggled in bankruptcy with a devastated economy and overwhelming financial obligations. One aspect of that process was the sale of confiscated German cargo vessels by the U.S. Shipping Board. On February 2, 1920 the Wall Street Journal reported, "All former German vessels will be sold fairly to various American shipping companies. Prices should be cut to a flat rate of $100 a ton so Americans can compete with British operators." According to the Washington Post, “The maritime career of Victor S. Fox is one of the romances even of the business world. According to stories that reached Washington, he was originally a theatrical costumer. Sensing a great fortune to be made out of the shipping buisness, he quickly formed the Consolidated Maritime Lines." On March 25, 1920 the New York Times reported the authorization of Victor S. Fox to issue one thousand shares of stock in the newly-incorporated Consolidated Maritime Lines. 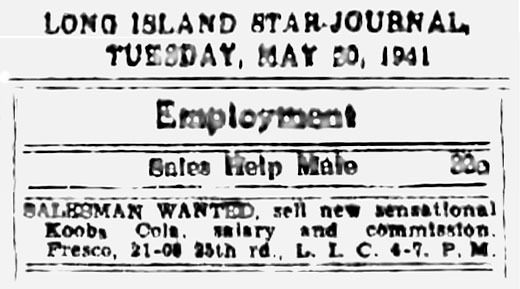 On April 11, 1920 the Wall Street Journal reported the U.S. Shipping Board had sold the first government owned steam ship, the Armenia, which was confiscated from Austria, to the Consolidated Maritime Line of New York. The purchase was arranged by Victor S. Fox, who said the vessel would carry grain and general cargo between South America, England and Germany. On April 12, 1920 the Wall Street Journal reported the U.S. Shipping Board had sold fourteen cargo vessels of 70,000 tons that were formerly under the German or Austrian flags for $15,000,000 to a newly organized company, the Consolidated Maritime Lines, under a financial plan that required only a nominal payment. Victor S. Fox said the company intended to buy several more steamers to carry considerable tonnage of grain and coal to worldwide ports. On April 20, 1920 the Washington Post reported the U.S. Shipping Board sold the steamship Castlewood (5,141 tons) and the Eastport (6,695 tons) to Victor S. Fox of NYC for $2,153,647. On June 8, 1920 the Wall Street Journal reported the incorporation of Victor S. Fox & Company to do freight forwarding and Custom House Brokerage business at 47 Broadway. The corporate partners were his sister Etta J. Fox and William H. Kaiser. On June 16, 1920 the New York Times reported Victor S. Fox, who headed the Consolidated Maritime Lines, had acquired substantial acreage of coal tract in Virginia to provide a steady source of fuel for the shipping line and fulfill his company's two-year contract to deliver 2,000,000 tons of coal to Italy. In the summer of 1920 Victor S. Fox began an annual routine of traveling to Havana, Cuba, to enjoy casino gambling and night life. On September 24, 1920 the Washington Post reported Victor S. Fox had been arrested in NYC and charged with attempt to defraud the government with falsified vouchers. On October 1, 1920 the New York Times reported a Federal inquiry was under way on Fox ship sales. Agents of the Department of Justice and the United States District Attorney admitted they were at work on the “Fox Case” but could not discuss the matter. Victor S. Fox had obtained very favorable purchase terms from certain members of the U.S. Shipping Board, under which he had been able to purchase a number of steamships on easy terms and comparatively small payment. On October 3, 1920 the Associated Press reported the U.S. Shipping Board had withdrawn control of twelve steamships obtained by Victor S. Fox of NYC on a partial payment plan until charges published in New York newspapers had been cleared up. On October 5, 1920 the Associated Press reported Victor S. Fox and W. H. Kaiser, steamship operators, were indicted by the Federal Grand Jury in NYC charged with engaging in conspiracy with intent to defraud the U. S. Shipping Board by making false accounts and vouchers. On October 8, 1920 the New York Times reported that an involuntary petition of bankruptcy was filed against Victor S. Fox by creditors, after the Federal Grand Jury indicted him for seeking to defraud the government. On May 14, 1922 the New York Tribune reported “Victor S. Fox, a theatrical costumer, began business on a shoe string, and for a time had hopes of making himself a figure in the steamship world. He bought ships at ten-per-cent cash and expected to pay off the remainder from current earnings. Unfortunately he went in on the ebb tide, which soon left him stranded on the sand." His trial lasted several years, over which time Victor S. Fox provided evidence of corruption against members of the U.S. Shipping Board and Government Office of Procurement. In 1929 Victor S. Fox was arrested and jailed as a stock swindler by a NYC District Attorney. He was identified as the President of The Allied Capital Corporation, with offices at 49 Broadway and 331 Madison Avenue. His business partner was listed as John A. Sachs. In 1936 Victor S. Fox became a magazine publisher. His periodicals were concerned with astrology, and included predictions of future trends in the stock market. In October of 1937 Fox Feature Syndicate was listed in the NYC business directory at 480 Lexington Avenue. The company published World Astrology Magazine. The magazine was distributed by IND, which was formed by Paul Sampliner and Harry Donenfeld. Their company also extended operated credit to the Fox Publishing Company and were located in the same building. 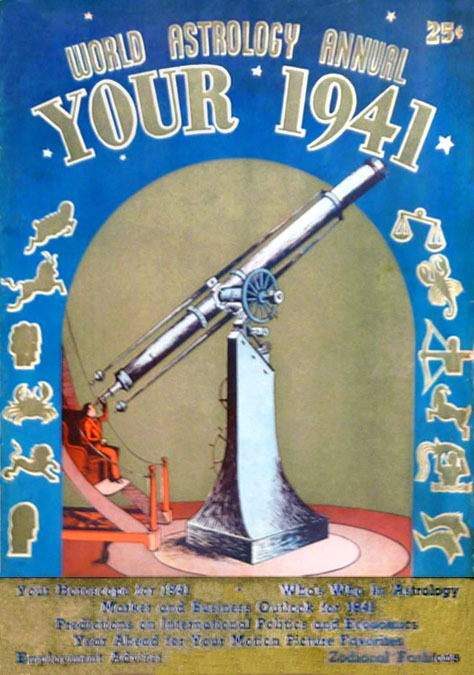 In December of 1937 Fox Publications of 480 Lexington Avenue purchased Rose Dawn's Modern Astrology Magazine with the intention to merge the title with World Astrology Magazine. In February of 1938 the mother of Victor S. Fox, Bessie Fox, died in NYC at the age of sixty-three. In 1939 Victor S. Fox was subpoenaed to testify before a NY State District Attorney in connection with unusual predictions published in World Astrology Magazine that stocks values would rise for McKasson & Robbins Securities, a company that was under investigation for stock swindling and blackmail. In 1940 Victor S. Fox lived in room #223 Manhattan at 142 East 49th Street. He was listed as single. His occupation was listed as a publisher of magazines. 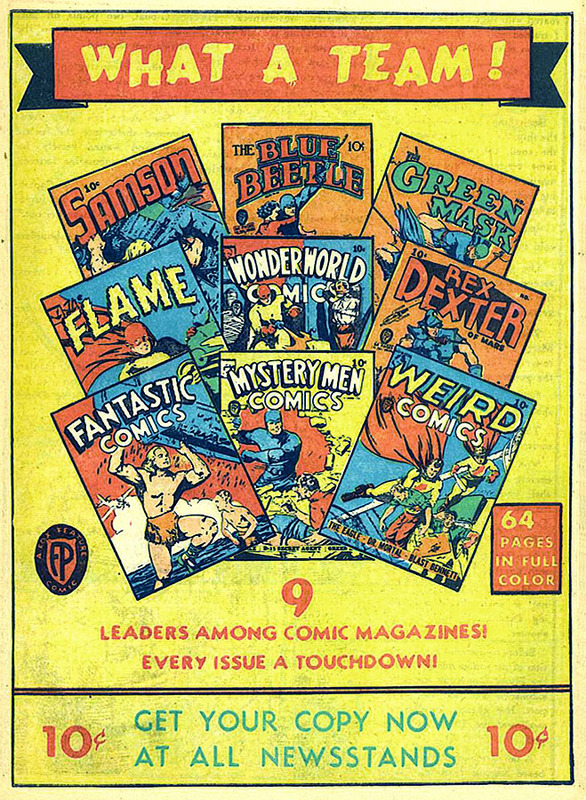 In 1939 Victor S. Fox began to produce comic books. He formed Fox Publications and Fox Feature Syndicate and rented office spoace at 480 Lexington Avenue, where Harry Donenfeld and Paul Sampliner also operated. Several office visitors later identified Robert W. Farrell as an early business associate. In 1940 Fox Feature Comics was sued by Harry Donenfeld, a business associate and rival comic book publisher, for infringement on their copyrighted character, Superman. 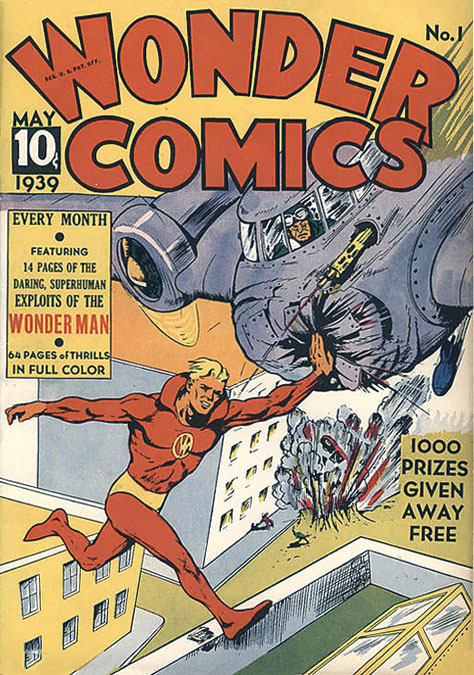 After one year of contentious litigation Victor S. Fox lost the lawsuit and ceased publication of Wonder World Comics. 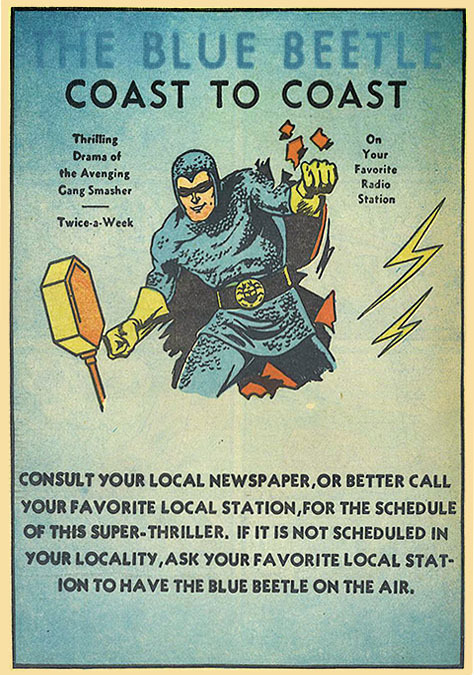 By 1940 The Blue Beetle was popular enough to warrant newspaper syndication, as well as a radio program, which was broadcast over WMCA-NYC for three years. 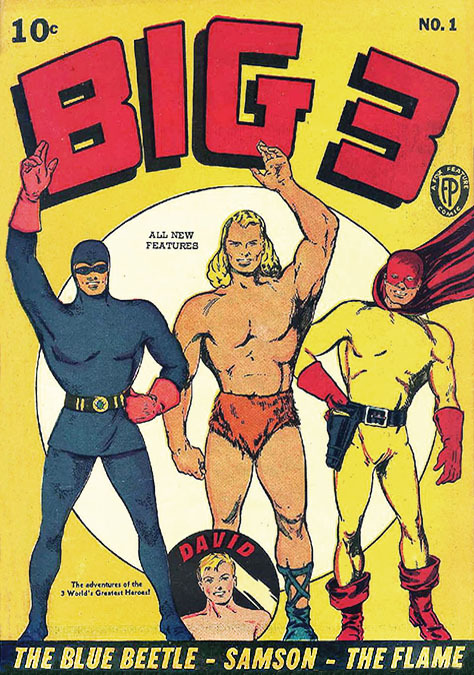 On November 21, 1941 Fox Publications copyrighted Blue Beetle, U.S. Jones, V Comics, Weird Comics, Wonder World Comics, Mystery Comics, World Astrology Magazine, Big Three Comics, Green Mask Comics, The Eagle Comics, and Flame Comics. 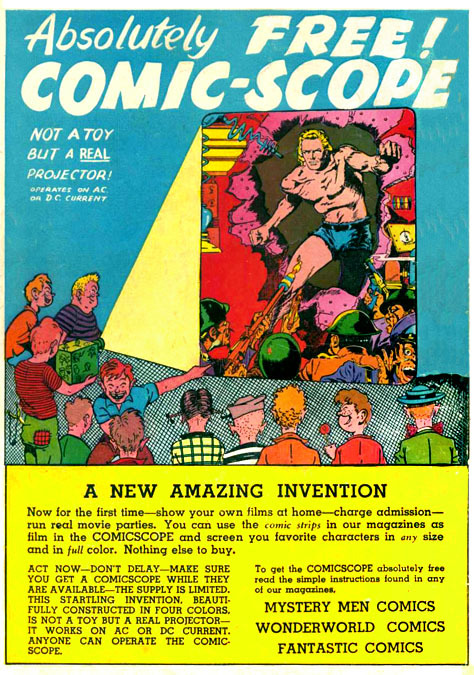 In 1940 Victor S. Fox and Robert W. Farrell sent plans to the U.S. Government Patent Office to register their copyright on the invention of an electric optical appliance, The Comic Scope. 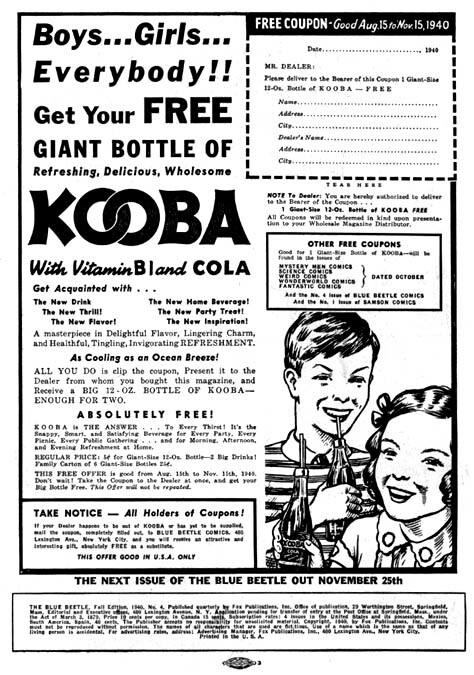 Subsequent advertisements for this contraption appeared in full-page advertisements on many comic books that were distributed by PDC (Publishers Distribution Corporation). The address listed on mail order coupons was 225 West 47th Street, which was the same location as the business office of Paul S. Manheimer, president of PDC. 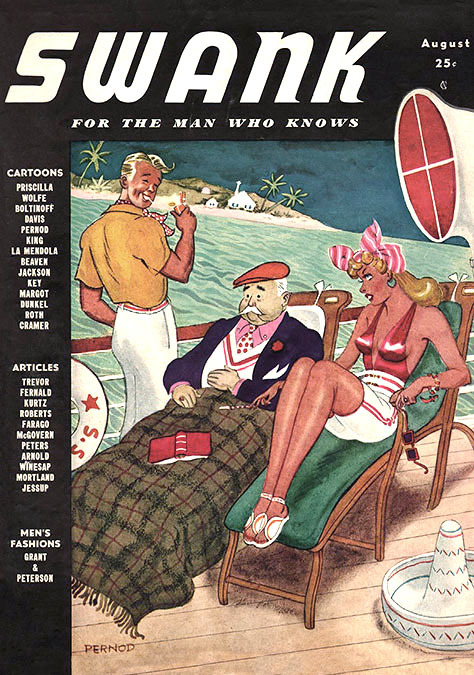 In 1941 Fox Publications produced a new men's magazine, Swank. The contents page listed A. H. Stillwell as the Advertising Manager. The executive offices were listed as 247 Park Avenue. 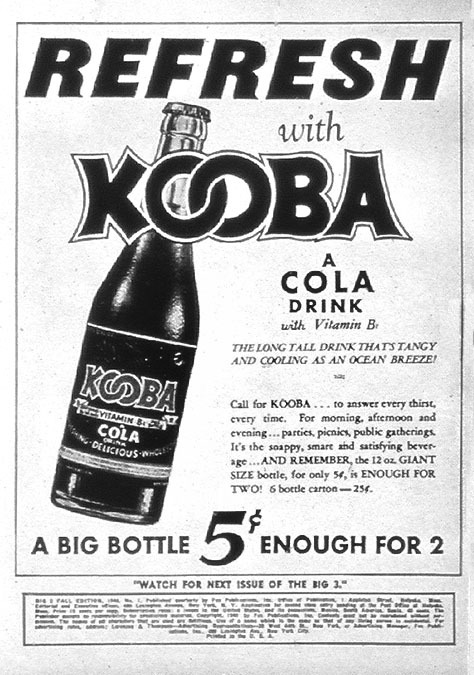 In 1941 several advertisements for Kooba Cola appeared in publications owned by Victor S. Fox. 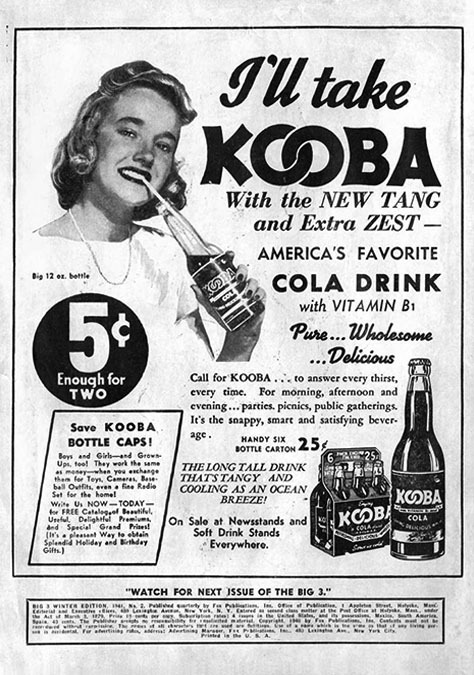 The November 1941 issue of The Eagle Comics #3 featured a back cover advertisement, as well as a two-page promotional campaign for Kooba Cola, which displayed a selection of novelty gifts that could be redeemed in exchange for Kooba Cola bottle caps and mailed to Kooba Corporation at 247 Park Avenue. This was also the address of Victor S. Fox. 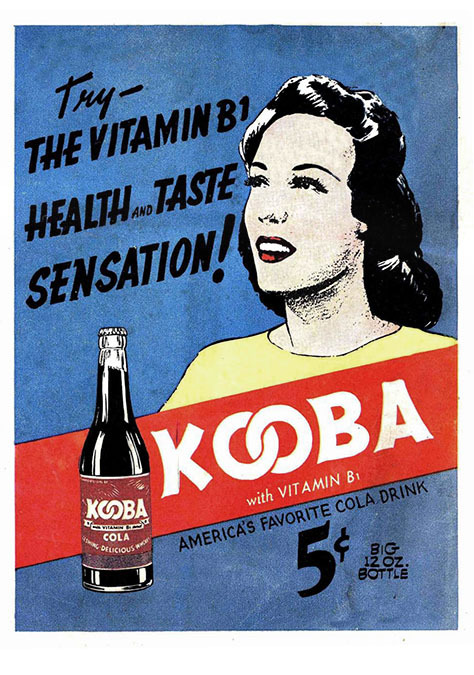 The name Kooba may refer to the Caribbean island nation Cuba, where Victor S. Fox had routinely traveled for annual vacations for twenty years. 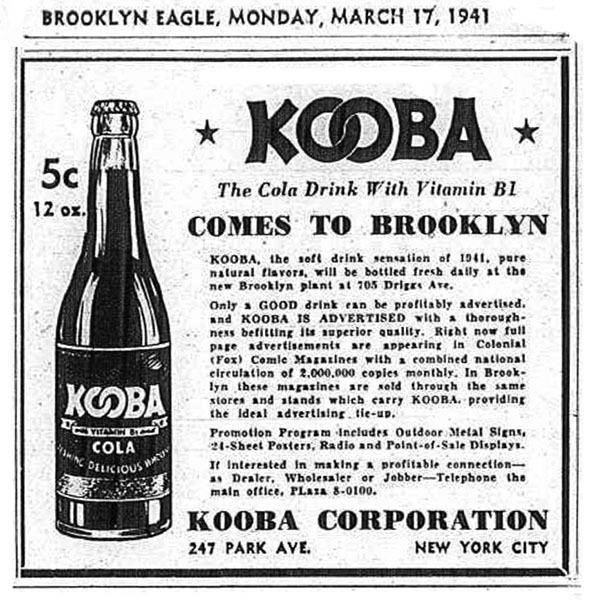 The major industry of Cuba is sugar, which was also the main ingredient in Kooba Cola, so this may have been a Cuban import business. 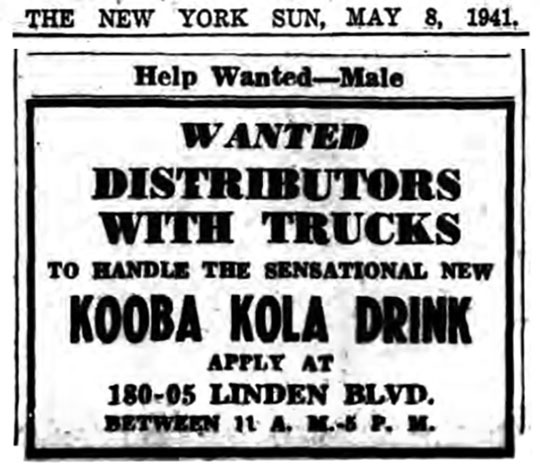 In 1941 NYC newspapers carried Want Ads for salesmen to represent Kooba Cola for the Fresco Beverage Bottling Company of 21-08 25th Road in Long Island City, NY. The older sister of Victor S. Fox married and became Mrs. Anna Fox Goldberg. She and her husband moved to Denver, Colorado, where they lived at 960 Grand Avenue. In 1943 Victor S. Fox married Carolyn Balevich. She was a thirty-seven-year-old office stenographer who lived at home with her parents at 455 Ridgewood Avenue in Brooklyn. She was born on December 12, 1906 in Long Island City, NY. The married couple moved to 142 East 49th Street. Their daughter, Victoria A. Fox, was born August 21, 1944. In 1944 during WWII Victor S. Fox was subpoenaed by a NY District Attorney to testify in a bribery case concerning a government Contract Procurer, who had previously worked in NYC as a fight promoter. During the case Victor S. Fox was identified as a part owner of the Cornwall Shipbuilding Company of Cornwall Landing, NY. His co-owners were listed as Milton A. Henry and Henry Glassgold. In 1945 the artist Al Feldstein (1925-2014), after his honorable discharge from military service in WWII, met Robert W. Farrell, who promised to introduce him to Victor S. Fox in exchange for a ten-percent commission on all future payments. The artist accepted the deal and proceeded to draw and write several contributions for the company. In 1946 Victor S. Fox and Fox Feature Syndicate were listed in NYC telephone directories at 60 East 42nd Street. From 1943 to 1947 the American publishing industry faced a serious challenge from a government program to ration paper sales. This unusual step was needed to coordinate international supply of paper during a critical period of reconstruction following the worldwide industrial devastation of WWII. This well-intentioned international program inadvertently resulted in a severe paper shortage that challenged the domestic publishing industry. During this crisis Victor S. Fox purchased a pulp paper manufacturing company in Potsdam, NY. He also bought Central Color Press of Wilkes-Barre, Pennsylvania. Newspaper accounts of these sensational transactions identified Victor S. Fox as the president of a NYC publishing syndicate. In some ways this approach to business reflected his earlier schemes to buy spectacular business properties on credit with cooked books and promises of future profits. Several months after these sensational purchases Victor S. Fox again filed for bankruptcy. 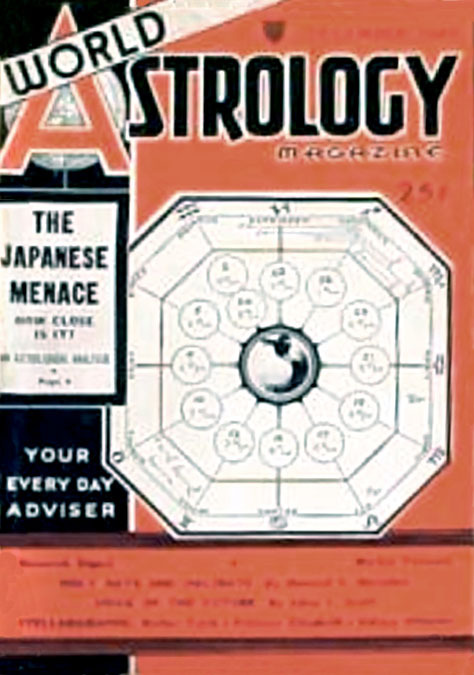 In 1952 World Astrology Magazine listed the editor as E. M. Gill and their executive offices at 9 Rockefeller Plaza. Victor S. Fox continued to produce magazines and comic books, which increasingly reflected the post-war trend of hard-boiled crime, mystery and horror. After the industry adopted the Comics Code Authority in 1954, Victor S. Fox sold his interest in The Blue Beetle to Charlton Comics. According to the artist, writer and editor, Joe Simon (1913-2011), "Victor Fox was a very strange character. He had a kind of a British accent. He was like five-two and told us he was a former ballroom dancer. He was very loud, menacing, and really a scary little guy. He used to say, 'I'm the King of Comics. I'm the King of Comics. I'm the King of Comics.' We couldn't stop him!" 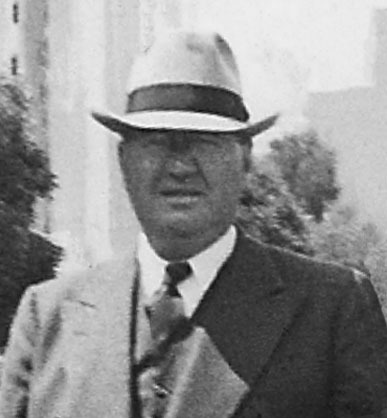 Victor S. Fox died at the age sixty-four in Greenwich, Connecticut, on July 6, 1957.